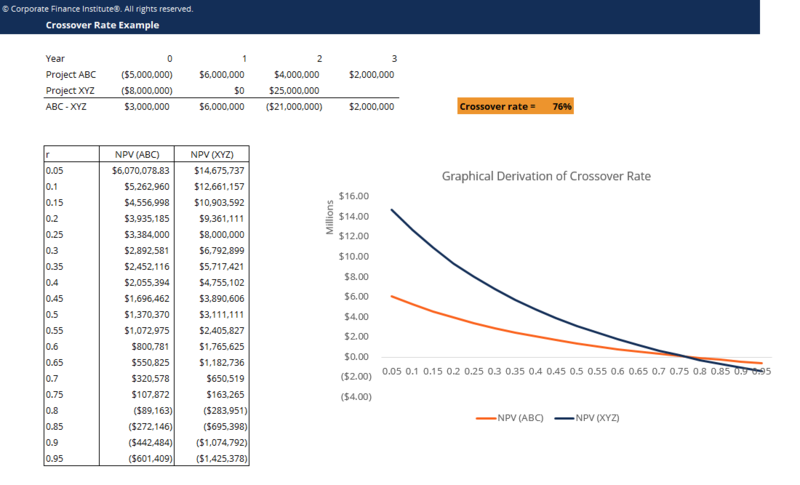 This crossover rate template will demonstrate how to calculate the NPV of different projects and plot the NPV profiles to identify the crossover rate. Crossover Rate is the rate of return (alternatively called weighted average cost of capitalWACCWACC is a firm’s Weighted Average Cost of Capital and represents its blended cost of capital including equity and debt. The WACC formula is = (E/V x Re) + ((D/V x Rd) x (1-T)). This guide will provide an overview of what it is, why its used, how to calculate it, and also provides a downloadable WACC calculator) at which the Net Present ValuesDCF Analysis InfographicHow discounted cash flow (DCF) really work. This DCF analysis infographic walks through the various steps involved in building a DCF model in Excel. (NPV) of two projects are equal. It represents the rate of return at which the net present value profile of one project intersects the net present value profile of another project. In capital budgeting analysis exercises, crossover rate is used to show when one investment project becomes superior to another as a result of a change in the rate of return (cost of capital).